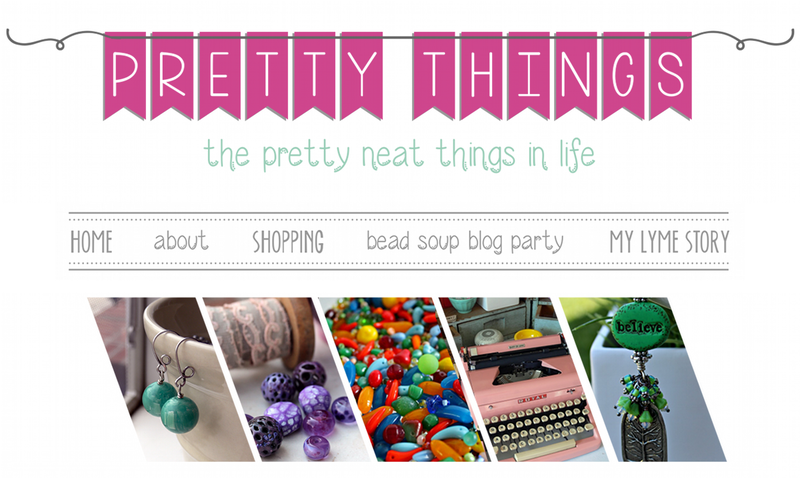 Pretty Things: 6th Bead Soup Blog Party, 2nd Reveal! 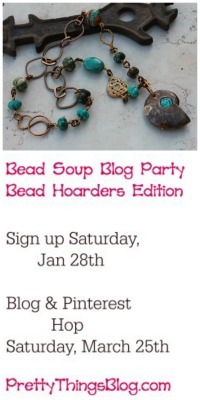 The Bead Soup Blog Party® has gotten so large over the years that I've had to split it into three reveal dates and change it from a twice yearly event to a once-a-year affair. If you've never participated before, you can read about it by clicking here, and keep your eyes open for the announcement of the new 2013 date, which will be in the Jan/Feb time frame. To give you an idea of how many people are in this particular Bead Soup Blog Party, take a look at the overall map: click for a larger view, and click here to see the maps split out in detail. Now without further ado, let me introduce you to my partner for this reveal and the beads she sent me! Marcia Dunne has a completely different style of jewelry than I do, and I love that. Her shop is one of my favorites and I love what she can do. She describes her style as bohemian, gothic, steampunk, Art Nouveau, and vintage, and I love all of those things but fail miserably at them. I thought with her as a partner, I'd really be pushed and I wasn't wrong. 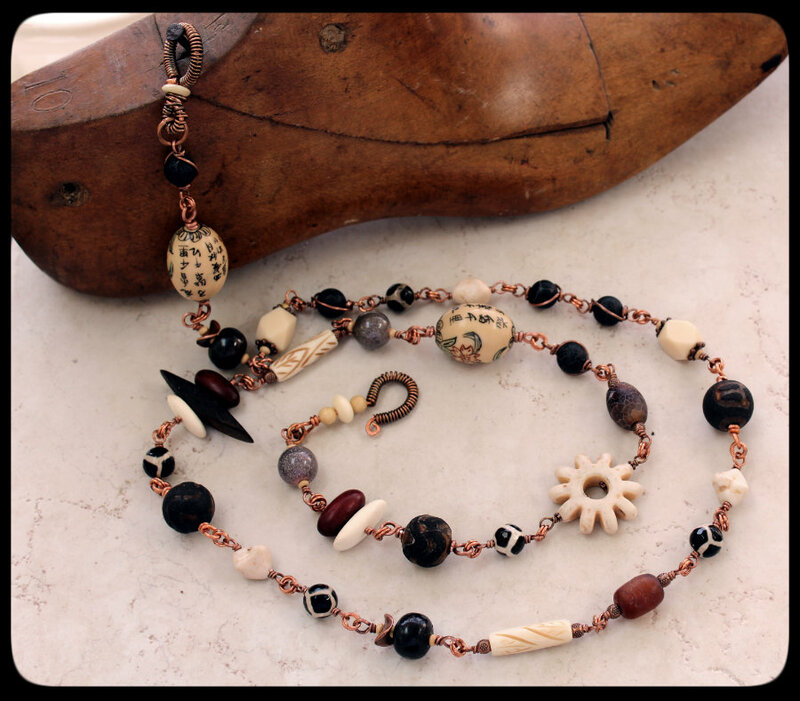 Silk ribbon, an Asian fan assemblage she painted, a handmade copper clasp, VERY cool dark agate with pattern, natural howlite, and vintage Lucite. In her note, she wrote that she was thinking of Katharine Hepburn in the "African Queen", a tribal, Edwardian theme. I actually rented the movie and watched it, and while I loved Hepburn and Bogart, I realized I am one of those people who isn't inspired by anything. And that makes me so sad! I envy people who say they're inspired by nature, or books, or movies, or what have you -- but I just don't have that creativity and just let the beads talk to me. And sometimes, they don't talk very loudly, so I have to ask them "Would you please repeat that?" The main thing that challenged me with this bead soup was its neutral palette. 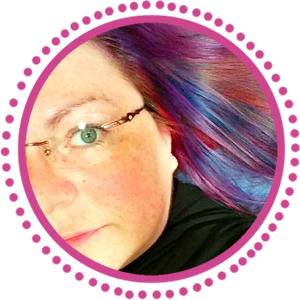 If you look at my blog header, you see I'm all about color. I thought for a while about instilling color into all these beads, but realized I wanted a challenge, darn it. So here we go! First, I chose the fan focal. I thought of Katharine Hepburn and her elegant bone structure. So I tried to go elegant, but quietly unique. I used a combination of lampwork beads, enamel beads, pearls, and Czech glass. 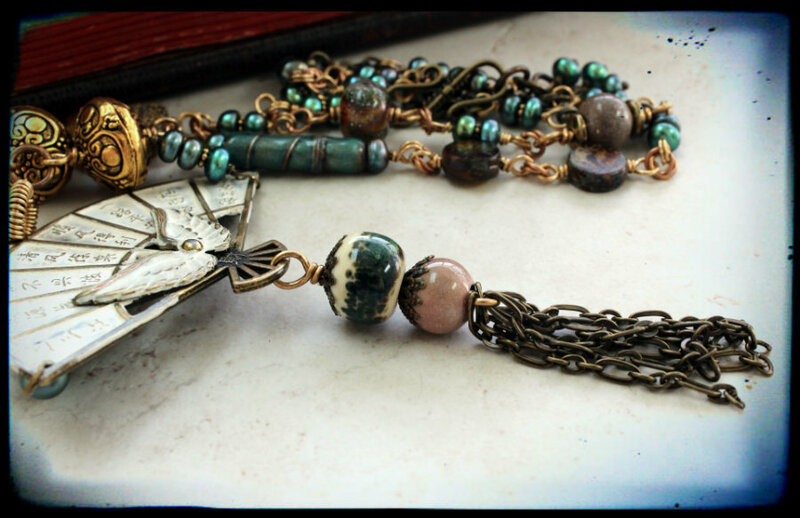 I made a tassel with antiqued brass chain lengths and two beads I made -- one lampwork and one enamel. For the bail, I made a heavy-gauge bronze jump ring and wrapped it with thinner gauge and tweaked one link up to hold the loops. I added two dangles on the corners out of green cultured pearls. I'm not sure if those pearls are a "go" or not. What do you think? I used a combination of antiqued brass and natural, more golden bronze, to give a subtle tonal texture. I added two large golden pewter beads to balance the bottom of the necklace, and then narrowed the profile with handmade glass and links of pearls and short double strands of chain. I linked all the loops together with small bronze links in a love knot configuration (it's all about details, you know?). I used 22-gauge bronze wire for the pearls, and since that gauge was thinner than what I'd used for the other beads, AND I didn't want the links to look too chintzy, I made double wrapped loops. Makes for a stronger loop, and a subtle design touch. For my main piece, (which you'll see last!) I made wrapped links with all the remaining beads, but when I started to put the necklace together, I realized the howlite dagger beads just weren't going to work. So I made what turned out to be a delicate tribal piece. The daggers aren't overpowering, and I found some very coolly textured Czech glass beads in my stash to mix with them, added a bit of ribbon at the back of the necklace, and here you go. I think I need to show that worn to give it its due. But it will hopefully appeal to someone who likes the tribal look but doesn't want to wear a full-fledged neckpiece. Now I decided to tackle the ribbon. I am NOT good with ribbon other than using it like I did in the above necklace, but I was bound and determined to use it this time. A friend told me to try braiding it, and at first I thought I'd use it, again, at the back of a necklace, but no -- that would be expected. So I made a strand of large pearls, all wire wrapped, and used that as one of the strands for the braid. I used a clasp by Keirsten Giles and I hope I did it justice. I still had silk left, so decided to make a less girly, more substantial bracelet. I thought Katharine Hepburn could have used these collaged hex nuts (from the Industrial Chic line) for fixing the African Queen! And I have no idea why, when I knotted the silk together, just the black showed through. I obviously have a lot to learn. I used almost every single bead in my creations and only added a few of my own. I knew this long necklace was going to be chunky, so I wrapped the lovely handmade clasp Marcia made me with oxidized copper so I wouldn't ruin it. The result is a long, very substantial necklace featuring a bit of Africa, a bit of Asia, and a lot of wire wrapping! Here's where I wrapped the clasp. I left the original metal unoxidized and oxidized the wrapping. I like that mix of metals -- it's subtle when worn and catches the light in a way you wouldn't think it would. Front and center is one of the enamel beads I made, and then some wood beads in mahogany and natural I added from my stash. 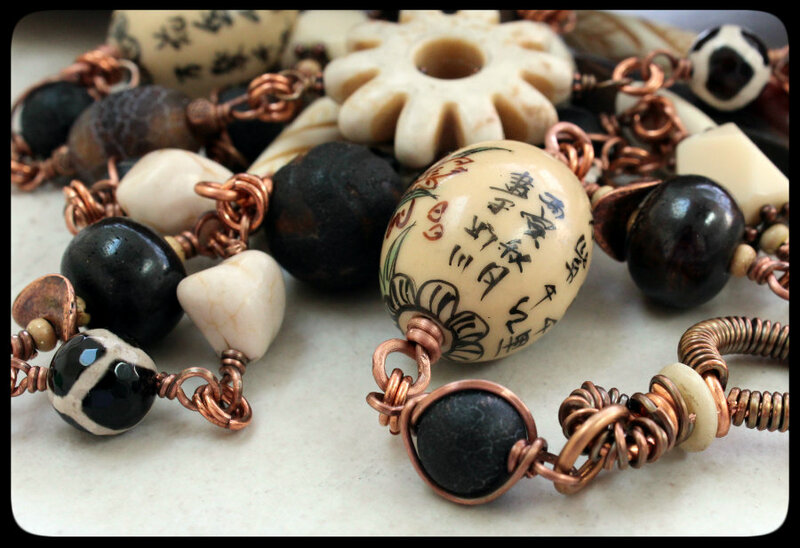 I added some wavy copper spacers to the plain jasper beads, and you can see one of the large Asian beads I got from an estate sale goodie basket. Here you can see one of my favorite beads, the carved jasper (?) rounds and the black-and-cream beads with a glossy finish. I mixed in the cream howlite and Lucite to lighten up the deeper colors. Another view of the bleached and mahogany wood I used with the longer piece of darker wood Marcia sent me, and details of the cool carved Lucite tube beads. And finally, I framed the plain black beads with copper to give them some character. I linked all the beads together with doublets of small bronze jump rings. And there you have it! I think you'll agree these pieces really challenged me as the beads were very cool but nothing I would have thought of using, and this challenge is EXACTLY what I love about the Bead Soup Blog Party! 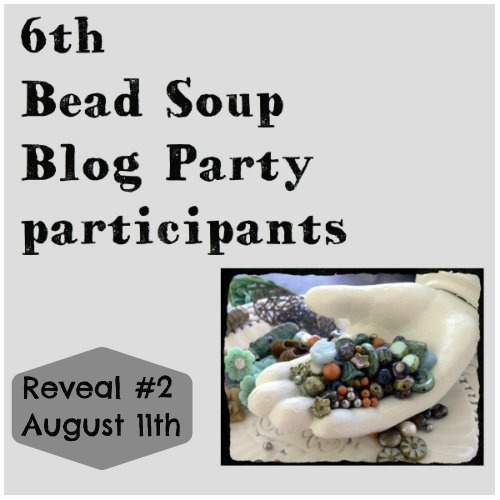 And now the rest of the 2nd reveal of the 6th Bead Soup Blog Party! Lois Moon, Que Onda, Q'Town? Mary Ellen Parker, BeeTree by m.e. Melissa Meman, Art. Life. Love. Sandra Young, It's a Bead Life! Tina Holden, Polymer Clay Bytes! Join me on August 25th for the final reveal! Gorgeous as usual! I adore what Marcia sent...I'm a tribal girl at heart! Thanks again for having the chutzpah to organize BSBP! Now...what am I going to do til Jan/Feb? I am sure you have heard this from many people but I must say it again, I LOVE your creations! I love your choice of colors and the beads u added. The first and last pieces are my favourite. Wow, they are all beautiful! Love them all! I think you should work with a neutral pallette more...since you did marvelously well for this challenge. I can't decide which piece is my favourite. They are all beautiful and the attention to detail in each is amazing. As for the pearls, they're a definite 'go' in my book :-). thanks so much for hosting this party and for letting us play again! Wow amazing, those teal pearls in the first necklace are stunning and I love your nuts!lol. The industrial with the silk is a great combo. So in love with your last piece that is definitely Katherine Hepburn's African Queen. See the movie seeped into your unconscious thoughts! WOW! 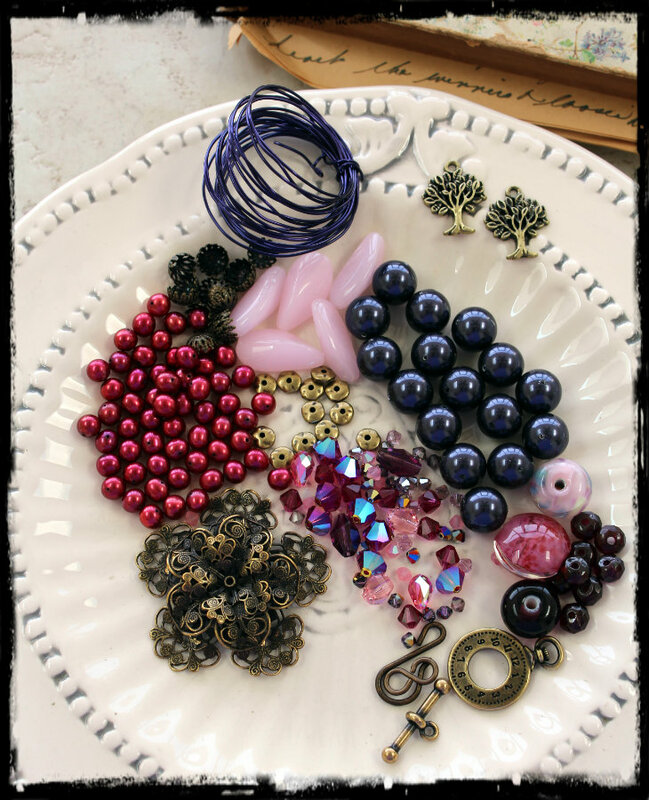 You were super busy creating some knock-out pieces of jewelry, Lori! It was really neat to see the bead soup in person and now made in to many beautiful pieces. 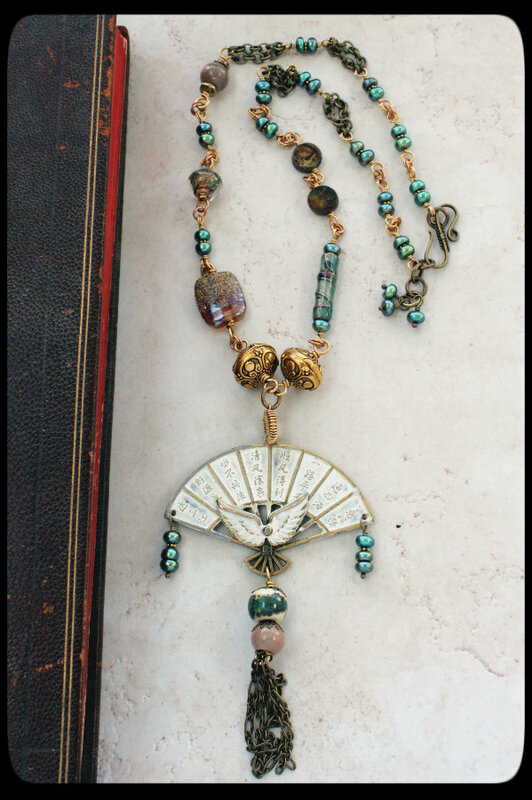 I just love those pearls mixed with brass in the fan necklace. It is amazing how you incorporated all of the components in really one-of-a-kind designs! Lori, might I just applaud you with all those pieces you did! I love the fact that you went outside your comfort zone with this soup and created things you wouldn't have normally created with techniques and materials you wouldn't normally have used. Thank you again for putting on such a fabulous party! I think you did a great job with your soup. Neutrals and naturals can be challenging for color lovers. I'm a big color lover too, but when I look at my stash, I have a ton of black and brown. I like all the extra wire details you used. Those finishing techniques really make your work stand out! Thanks again, Lori, for all your efforts in organizing the BSBP. It's so much fun to see all the creativity of the participants! Gorgeous designs Lori! That last necklace is my favorite, but I also really like that hex nut bracelet. I love the way you create! And this focal is mmm...yummy! Lori amazing long necklace. I love the details!!!! Wonderful pieces for your 2nd reveal. The first piece is my favorite. I really like the bracelets...I think you did pretty well with the silk. I just started using fabric myself and really love it. Thanks again for all your hard work...I am loving my first bead soup party! Wow Lori, were you inspired by the theme and great soup you were sent! I would say so..!! The necklace is organic elegance and I love the fan pendant its so beautiful. The second necklace is stunning and so are those big oval Asian beads, I can never find anything like those just the tacky ones! Hope you get time to hop over to my blog. You made everything so lovely with your magic once again :-D I like very much the bracelet with knotted silk! Double loop wire wrap: what a cool technique!!! I'll definitely be using this one. And as always: you're the undisputed queen of metal mixing! it is perfect, beautiful, I love it!! I love the whole theme! All of your pieces are wonderful. I love, love the use of the ribbon. That is something I struggle with! Like you, I love wire work and yours is wonderful! Slurpable soup! Wow Lori! Great job! I didn't see that in your soup ingredients. So much fun to see what everyone comes up with! What can I say, I love how you have taken the beads and made them speak your language... and quite multi-lingual bringing the continents together and colorful too (not the language!). Love it all, my favorite would be the long African/Asian necklace. Thank you Lori for all that you do for us beaders. I can not pick a favorite !!! When I saw the first necklace I was sure it would be my fav. But, then I scrolled down and fell in love with each piece in turn . I LOVE the color pallet and your designs always rock my world . PS Thank you,Thank you,Thank you for organizing the serving of the soups!!! Beautiful work. Another great soup. Lori - WOW! That fan focal piece is so special. I am in love with it!! I love the colors you chose and just the design all around! As always, I am blown away by the use of fiber!!! Everything is so beautiful that you created with your soup! Great work Lori! Steampunk and industrial would be very challenging for me too. I think you met the challenge! All of the designs are excellent, but I really like "Katherine". 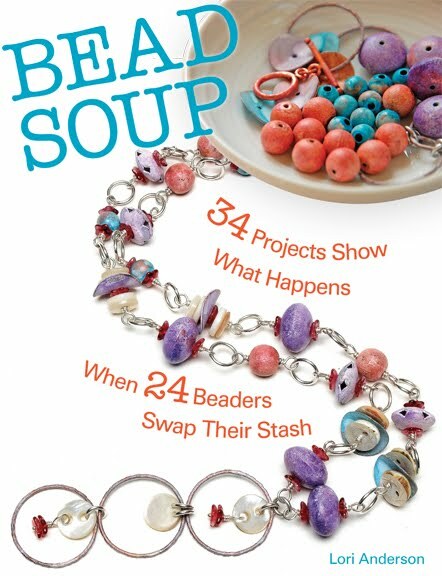 Thanks for all your hard work hosting another Bead Soup Blog Party! Hi Lori! I love all your pieces, you did a masterful jobs merging your style and that of the soup. Great job as always! Lori, as usual, you have hit the ball out of the park. I am always amazed at your creativity and ingenuity! Thank you so much for hosting this 6th bead soup blog party! I've so enjoyed participating! Of all your lovely pieces I think your first necklace is my favorite (and yes, the green pearls go!)! Lori, I love what you made with your soup! Lori, you may not be inspired by outside influences, but obviously you have inspiration galore inside. Everything you make is absolutely gorgeous! That first necklace is my favorite, but they're all beautiful. Oh, love love love that last necklace, it's just fantastic! 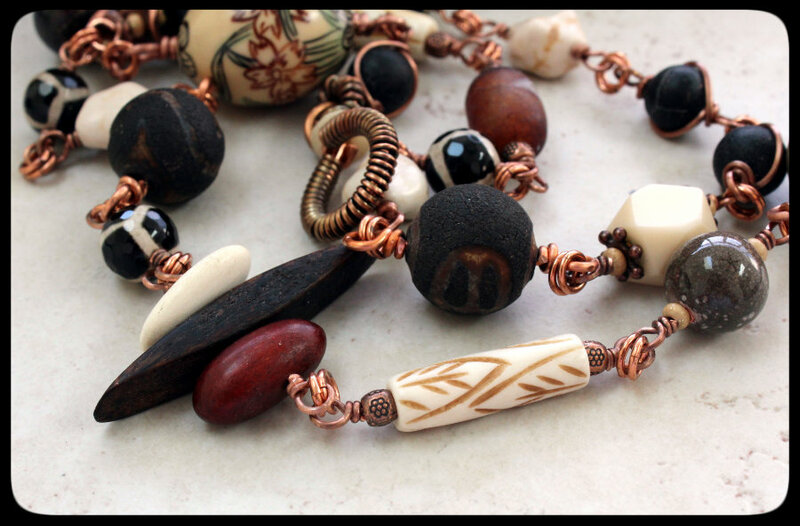 You've made some gorgeous pieces with your second bead soup! 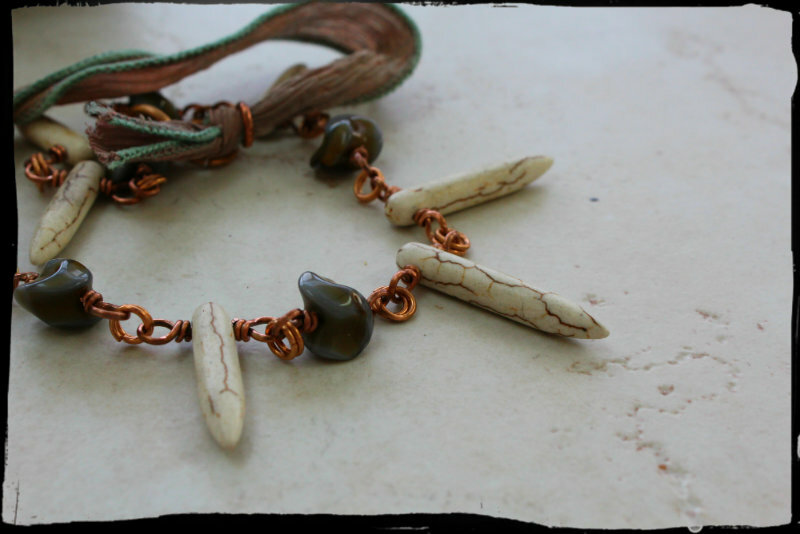 The challenge of using materials outside of your usual is exactly what I love about Bead Soup. I love all of these pieces and how you injected just the right amount of color without overwhelming the neutral palette. Loooovely! Thank you so much for all you do to make this bead Soup party such an incredible experience! I love what you made with your beads. The last necklace is my favorite!! Wow, beautiful work! Thanks again for hosting this explosion of creativity! You did a wonderful job with your challenge. I like the little pearls on the outside of the fan. I think it does 'Katherine' justice. The dagger neclace is great. I like the look of the daggers and the ribbon together. That Bracelet with the pearls and silk is a killer. I think it's my favorite. Your last necklace is wonderful, too. I really enjoy the mix of everything in it. Very nice job with your 'challenge'. I so love your last necklace! Your wire wrapping is perfect! Love the color theme and your designs in all you pieces! Wow, Lori! You outdid yourself again:) Love all the pieces, especially the last piece with the asian beads and the first piece with the fan. Lovely! I love the first bracelet! I really like the colors you used! All of your designs are just beautiful! You created allot out of your soup. The bracelet with the copper focal flower is my fave. I have a shirt that matches that! The first necklace also my fave. You sent me some blue beads like that, Now I know they can be wire wrapped. Lori, everything you made is gorgeous! Your first necklace is stunning and I love that Katharine Hepburn was your inspiration. I absolutely loved all of those pieces Lori. 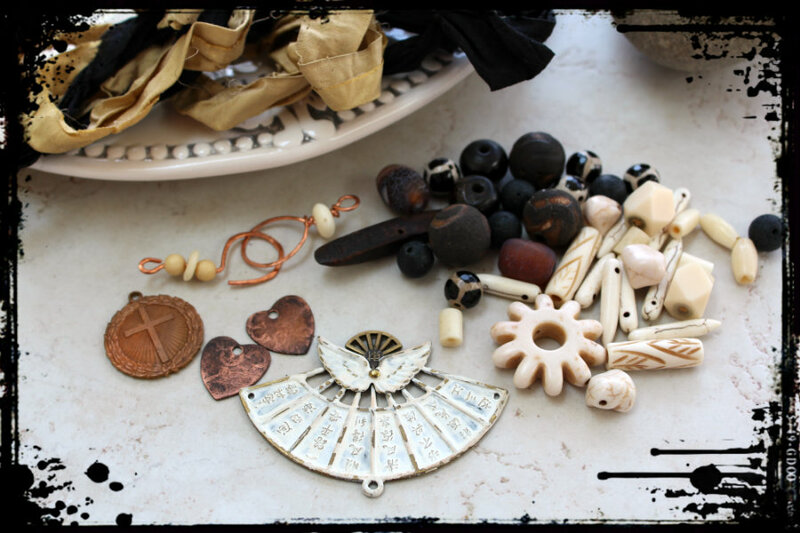 I am in love with the carved beads, and I love the bracelet that you did with the ribbon, and the words on metal nuts? LOVE THEM! Thank you for hosting a wonderful event, this was so much fun. Everything is just beautiful, Lori! 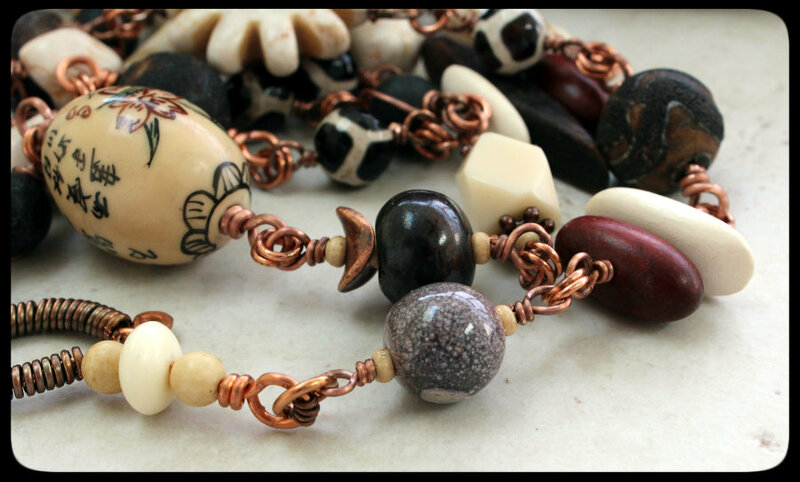 I love how you took beads that are normally not your style, and created such lovely and creative pieces with them. The way you used the ribbon on the bracelet is really cool. UHHHH.... They are soooo pretty! Warm colours, touching designs... Great job! Kisses! whoa. You've been a busy cook. what beautiful pieces! Wow Lori, You really were challenged with this bead soup, but you came out on top. I love what your created with the beads Marcia sent to you. My favorite is Katherine she is gorgeous! All of your pieces are beautiful! Great pieces Lori - love the colors that you mixed together! Thanks for another great BSBP! I love your love knot links. I love all of your work. With all the detailed work you do, your pieces should sell for hundreds of dollars. Thanks again for your work and inspiration. your pieces are all so beautiful and unique. I would wear everyone of them. Very cool global look on all of these pieces. Love "Katharine" but enchanted with the last necklace. Looks like something I'd bring home from a great trip! Lori, your work never fails to impress me. I'm afraid I love the first one best, although the fiber and hex nut one is a close second! I don't care that only the black showed through, it worked, and that is what's important. Nicely done! Lori that fan necklace is TDF, I absolutely love it. You do such amazing work and your photography blows me away as well. Thanks for allowing me to participate in BSBP, it was a blast and I'm having so much fun seeing all the blogs and creations! Love all your pieces, especially the necklace. I know what you mean about inspiration. I usually let the beads and metal speak to me. Another great Soup, my dear. Now, I'm so happy you were able to take those ingredients that are so not you and make them your own. I especially like your first and last necklaces. As always Miss Lori, you've created some stunning jewelry and a fun hop. You should be proud! all these are wonderful...really like the unexpected look in the bracelets..and that last piece is gorgeous..
What beautiful work Lori! You are such a gifted designer and I love every single piece. You know, I was worried when I saw that soup. It didn't look like your normal style. I shouldn't have. You did a great job moving outside your comfort zone, with some awesome tips on copper, and mixing metals. Surprisingly, I really love that hex nut bracelet. (not a steampunk girl) I have to say, the last necklace is so pretty, again, not my stle, but I could see myself wearing it, which to me is a tribute to your design success. Thank you for opening my eyes to design possibilities! I love what you did with your soup!! I really love the way the one with the pearls and fiber turned out, and the necklace you did with the fan is stunning. Everything is beautiful, great job and thank you for the chance to participate in my first bead soup!! Lots of great work here I really love the first necklace and I would keep the little pearls hanging from the fan!! Hi Lori! Your soups turned out divine, so creative. My favorite, if I had to pick, would be the tribal necklace - love, love, love! I love all your designs, Lori! Beautiful wire wrapping skills! I especially like the last necklace. What a great combination! Your gift for design and craftsmanship never ceases to amaze me! I LOVE, LOVE, LOVE the necklace with the fan pendant! How in the world do you find the time to make such creations and still orchestrate the BSBP? I love the "Katherine"! And I like the green pearls dangling from the ends--it balances out the pendant for me! Wonderful job working with all of those neutral hues--I love color, too, and rely on it, so I know how hard that can be! What cool soup, love the fan necklace. Thanks for sharing all the little details on your designs. I am in this reveal and 3 and I am still alread looking forward to Jan. These are so much fun. I really do not know how you do it, but I am glad you do! Ah, Lori...it's always a treat to visit your site and see the gorgeousness you've created! Thank you for being an inspiration to so many of us...it's a special gift that you give every single day! I love how your soup turned out!! Your Hepburn piece is just lovely, I love how you used the pearls in pairs, and your double loops are divine! I will have to try that--small holes are so frustrating when you like to use heavier wire. I love how you mixed antiqued and bright brass. I vote YES for the pearls on the focal! it reminds me of the gorgeous hairpieces Japanese Geishas used to wear! And I LOVE the piece with my flower clasp--I like those clasps combined with distinctly non-flowery elements, your fabric is perfect! And I love the black/white/khaki palette with it--cool and urban, but with just a little touch of luxe with the pearls. Great mix of feels and styles. Makes me want to make more and do something just like that! They are all gorgeous as usual but Katherine really reaches out and grabs me. Great work! All are just gorgeous! I love the idea of wire wrapping the big pearls and using them as a strand to braid. I hope to give that a try. Thanks for all the time you put into making this possible. Gorgeous work, I love the fan necklace. What a great soup! Lori - as usual your pieces leave me speechless - they are simply just stunning works of art! What you create from your goodies is mind blowingly awesome! They each are one-of-a-kind treasures and it is so hard to pick a favorite one. Gorgeous creations Lori! Oh Lori You have done it again I really like what you did and I think that letting the beads speak to you. That I do with fabric. as well.I really like what you did with the wire wrap. Be blessed to be a blessing. Lori... wow you really went to work!! I enjoyed seeing & reading about each thing you made and I think you did a really good job!!! My favorite is "Katharine". It's an honor to view your work! Your designs ate fabulous! I love all of the wire work in your pieces. IMHO, the side pearls on the side of the fan focal are the perfect touch! Love them all, but my two favorite details are the way you wire wrapped the clasp, and the bracelet with Kiersten's clasp...STUNNING!!!! Miss Hepburn would have worn that necklace proudly -- and I think she'd have enjoyed the pearls on the sides of the fan. But I particularly love the treasure necklace. What a terrific combination of texture and materials! Ok I want them all! The necklace with the fan focal is to die for! Wow! Wow! You outdid yourself Lori. I would say you were totally inspired. I love that movie. Your designs are awesome but I've gott tell you the 2 bottom bracelets are fabulous. Great job girlfriend. As always you rock'd the house! 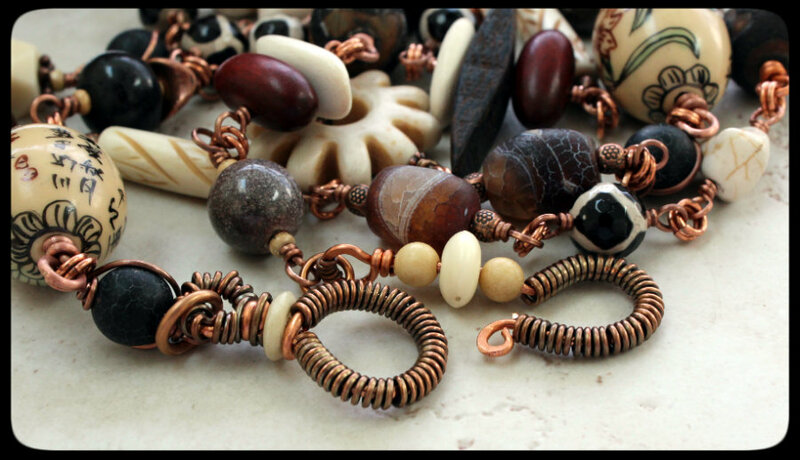 Luv the designs and the bracelets are scrumpcious (only csuse im a bracelet grrl!). TY for all you do Divine one! Thank you Lori for yet another successful BSBP. I could definitely see K.H. wearing that necklace. It's strong, bold and beautiful like she was. Love the necklace with the daggers. I picture you walking, barefoot along a beautiful beach in a beautiful sundress. The bracelets are so bold and beautiful, so K.H. I LOVE that you made a long, long necklace. It's gorgeous! You did some amazing wirework and I digging the clasp! Your designs - as always - are amazing! Thank you so much for hosting this... I can't tell you how much enjoyment I have from making and sending my bead soup, receiving it and also in the creating a new design from the swap I get. Then, there is the 'hopping' around....what fun!! Gorgeous work, you are an amazing designer. Love the last piece the most, I would wear that all the time. Thanks so much for hosting such a great party, it is so much fun!!! My goodness I love the first necklace..such beautiful colors! I can definitely see myself wearing it and i know exactly what outfit i would wear! Another wonderful bead soup part! I so enjoy them so much..even if i am not a participant this time around, I still love blog hopping! What an amazing collection! You didn't just succeed, you succeeded beautifully! I love the necklace with the dagger beads; the colors of the ribbon is gorgeous. I also really like your bracelets too (great movie reference)! The last piece is the bomb! Love the wire work and variety of beads-great mix! Goodness gracious, here's another example of how you inspire me. Things out of your comfort zone and STILL you make them into something amazing! 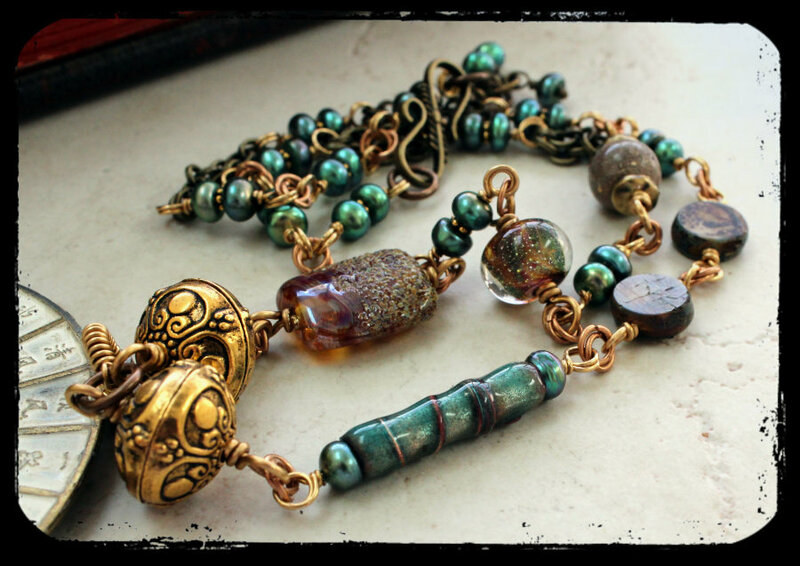 I love the lampwork and pearls in the first necklace, the colour reminds me of verdigris copper. I also love the last long necklace with all it's interesting details. Every bead is a treasure. I love your fan necklace - the colors are gorgeous and the wire work bail worked perfectly. 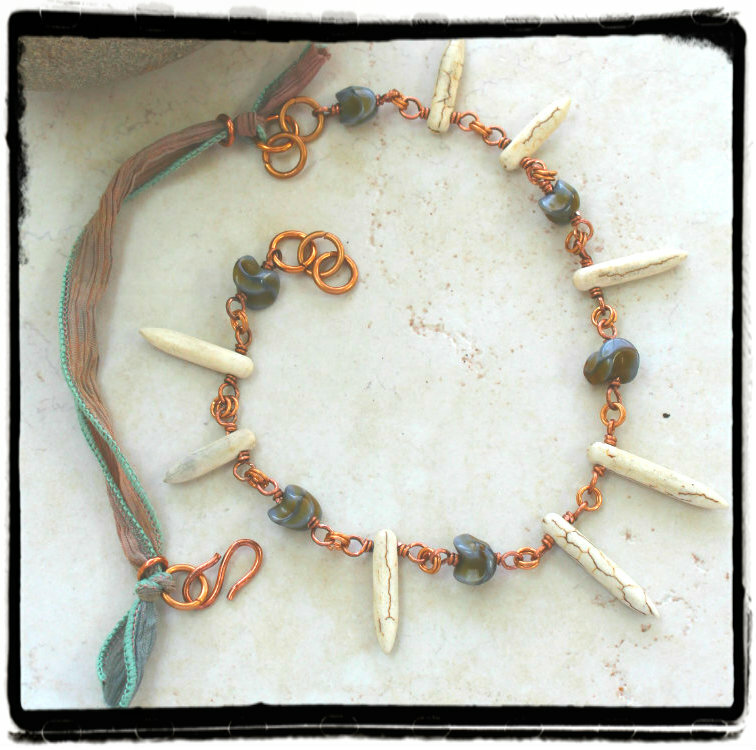 Love the delicate tribal necklace - copper was a good choice. Great job with the silk ribbon on both bracelets! I am inspired by your mixed bead grand finale - I have been wanting to create these as well. Wow Lori -- I don't know where to begin....they're all fabulous! I love the beads you used in the first set and think they accent the bronze beads perfectly. The last pendant is magnificent, and the bracelets are lovely. Thanks again for hosting this wonderful event!! I am definitely going to have to take up wireworking after seeing the dimension and beauty you brought to each and every piece. It's not possible to choose a favorite! Thanks again for bringing us this hop. What's more fun than a party with (new and old) beading friends? There was literally inspiration on every blog! You really jumped out of the box and did a wonderful job with the neutral colors you were sent in your soup. All the pieces are beautiful! Love the colors and design of your Katherine necklace! As always beautiful work! Katherine Hepburn was such a classy lady, beautiful inside and out. I think she would have loved all these wonderful art pieces you created in her honour, Lori. A gift to the Queen of the Matinee... from the Queen of the Beady Inspiration! Elegant? Oh my,yes, but with a kick of fun and attitude! I was stunned to read your self-deprecating remarks about having "no creativity", and not being particularly inspired by what-have-you. As a beginning designer, I was assuming that would develop in time, if I just kept plugging away. My biggest problem is trying to "take charge" of my beads, and I struggle give up control to them LOL. So your words are a real eye-opener, Lori, and I thank you for sharing your process and musings. So so pretty....the wirework is terrific! And I love how you incorporated the fabric into the pieces. Thank you so much for being the perfect hostess!!! What amazing pieces, Lori! I love the Asian influence on these! My favs are the fan necklace and the bracelet with Keirsten's clasp. I, too, have issues when working with fibers and ribbon. I thought you did a fabulous job! Thank you again for hosting! Well Lori, I always like to save you for last - always worth the wait! I for one like the drama of the pearls on the fan... I haven't scanned the comments to see if I'm in the minority, yet. I love all the details you manage to work in, it's so impressive. Thank you for all you do and all the inspiration you spread - oh boy does it ripple and multiply! to be honest I really can't tell which of your outstanding pieces I like most!!! They are all so lovely! I do love the use of silk ribbons as I also did in one of my pieces this time. But I do adore your first necklace with the Katherine Hepburn style. Awesome!!! I love seeing how you took the stash and made it work for you, despite initial misgivings. I'm always afraid to mix different metals and patinas, so thanks for calling that out in your design - you're right it can work and does add a subtle point of interest. And I'm so impressed how you went through the entire stash - each piece is so unique, though my favorite is your last necklace. Katharine: Your beads -- the enamel and lampwork above the tassel -- are gorgeous! And they are completely gorgeous with the teal pearls, which I think are beyond perfect with the soup beads and your design! 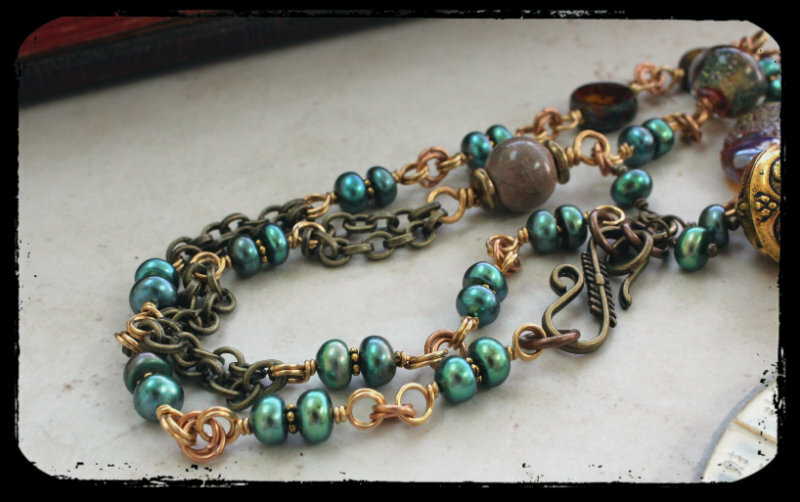 The teal pearls give the piece a twilight evening romance feel that completely compliments the fan focal, and the love knots are divine, giving a nod to the theme here and your talents at chain maille! (I saw previous posts and photos ... :) Also, perfect use of antique brass and brass chain/metal work. Tribal w/ Daggers: Cool! The czech beads have this abstract look of howlite skulls, complimenting and accenting the howlite daggers in the finest way... I LOVE this piece!! 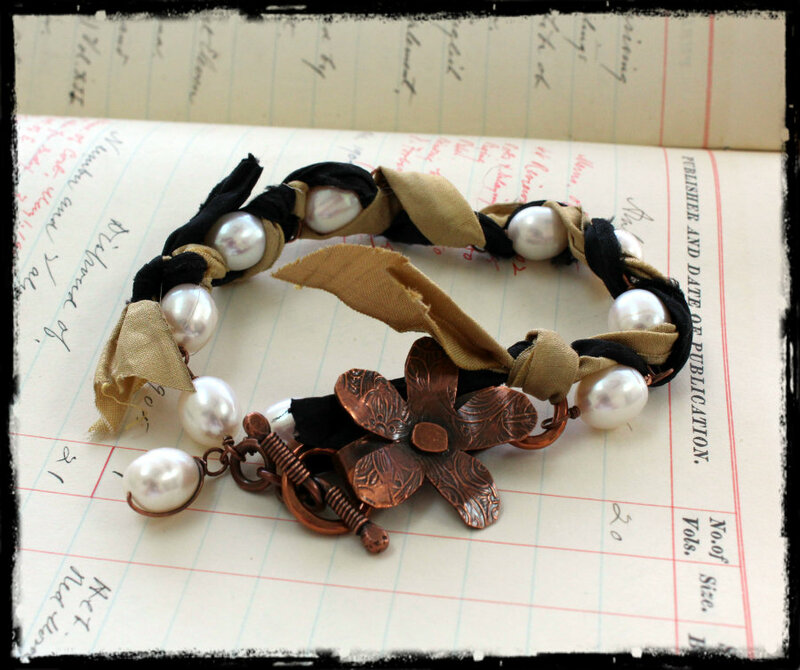 Ribbon bracelets: Love the high-end pearls with the neutral ribbons and floral clasp -- shabby chic! When I read "Now I decided to tackle the ribbon" I giggled. That's how I feel about it, and you used it artfully and beautifully! Bravo! 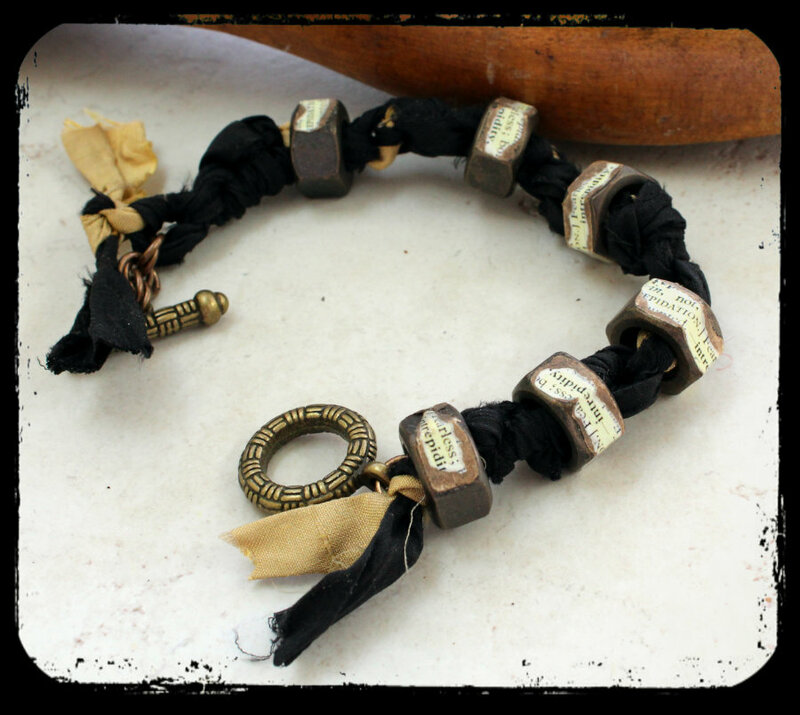 And in the cool Industrial Chic bracelet, I like the dominant black with tan accents! I thought you did this purposefully to mirror the hex nut beads! Looks wicked good! Grand Africa/Asia: The dark agate with pattern beads are brilliant with the estate sale Asian beads! 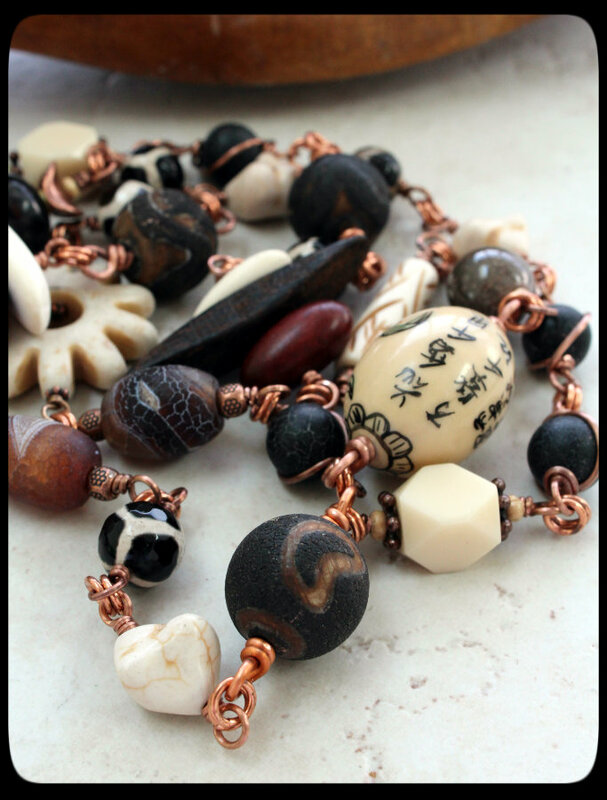 And the copper wrapped black beads, creamy lucite, carved jasper, wood and your enamel bead all look a-m-a-z-i-n-g together! Grand, gorgeous design! Can you believe I'm still working my way through the blogs? I started at the bottom for a while, switched and started at the top in hopes of meeting in the middle soon. Wow, so many pieces! Lovin' that bracelet with the copper flower. Those are definitly your colours, Lori! Couldn't decide, which piece I like the most.... Wonderful designs! Lori, these are just lovely, I love the little macrame net with beads and I love the green bead necklace with the lucite flowers that is so Lori! What a fun bead soup this has been!